Château Coutet is one of my favorite Sauternes of all. When the estate decides the vintage is good enough to warrant making their ultra-luscious, super-concentrated Cuvée Madame (named after a previous housekeeper), it is my favorite Barsac of all, duking it out with d’Yquem for numero 1 in Bordeaux sweet winedom. Coutet (the name of which derives from the Gascon word meaning knife) has been owned by the Baly family since 1977, but sweet wine was being made on the premises as far back in 1643. 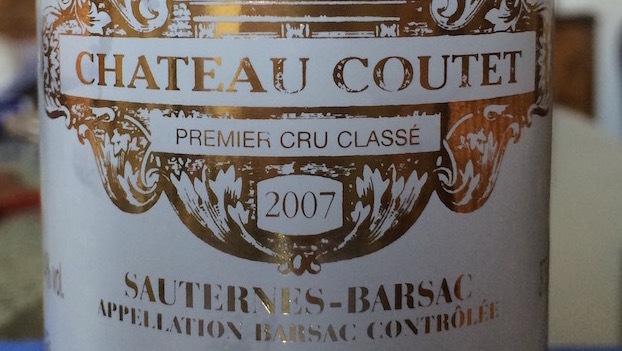 Château Coutet is located in the southern part of the appellation and at 35 hectares large (planted to 75% Sémillon, 23% Sauvignon Blanc and 2% Muscadelle on mainly clay-limestone with some gravel), it is one of Barsac’s largest properties. The 2007 reflects the high quality of the vintage, with overt, honeyed tropical fruit, lemon curd, and spicy botrytis aromas and flavors in spades. If I have one quibble, is that the 2007 seems to be just a little less complex and long than I might have expected given the stellar year, but perhaps I just caught it in a shut-down phase. Certainly, there’s no arguing with this wine’s purity and refinement. The 2007 is likely to develop greater grace and nuance still with age. 92+/Drinking window: 2017-2035.